I made some progress on my swap quilt this week.I decided to stitch the hexagons to the background by machine as the turtles will be machine appliqued, too. There will be hand quilting though; I found 7 blues and greens in my embroidery floss stash and will try to use most or maybe all of them in some kind of wavy, watery-feeling stitching. I saw this cute idea in my google reader and wanted to share it: DIY quilting gloves! I love this idea. I am making waterproof training pants for my girl today... she has outgrown the first group I made for her and some of those I never even finished. So I went a size up and am finishing them one at a time. I finished one so far toda; 3 more are cut out and started. And I'm in the middle of a big fabric reorganization/purge. I am trying to decide whether I should offer some fabrics from my stash for sale... I have a bunch of vintage sheet fabrics, an Orla Kiely for Target tablecloth and some placemats and napkins, some PUL for diaper covers, and maybe some apparel fabrics that I am willing to part with. Would any of you be interested in any of these? *I'm linking up at Sew & Tell Friday, go see what everyone's been doing this week! Cute hexies! Love the colors. Quilting gloves . . . I just use the cheap, yellow dishwashing gloves. Work great and I think you can get a couple of pair for a dollar. Plus they are not so bulky. 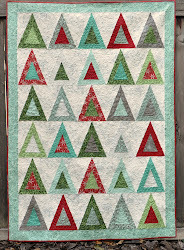 what a great little quilt!! I love it!! I think just about everyone is up for "sale fabric"
Oh those turtles - perfect! Oooo..I love those hexies :) Nice ! 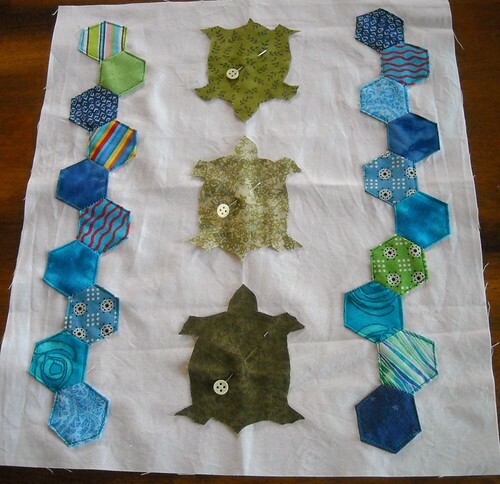 Cute turtle quilt! The embroidery thread idea sounds wonderful!